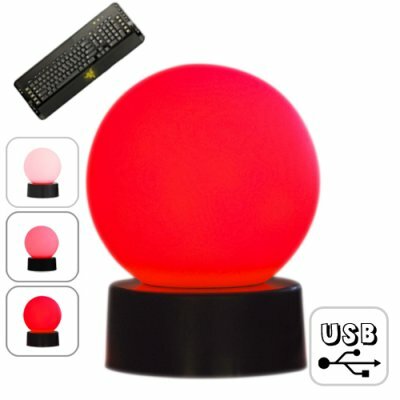 Successfully Added USB LED Globe with Keyboard Response Light to your Shopping Cart. Desktop sized LED Globe Light. This unique LED Gadget has a special feature that will really amaze you and your coworkers - as you type on your computer the LED light will start to glow brighter and brighter. Type and watch the LED glow brighter and brighter as you keep on typing. This cool new gadget makes a great desktop companion. Simply connect the USB globe LED light to your laptop or computer's USB port. Next, install the included software with takes less than one minute to install. Then start typing and watch the Globe LED light glow brighter and brighter. The faster you type the brighter it gets. This model works on all Windows operating systems. The Red LED Glow Light works in conjunction with any software on your PC, whether you are chatting on Skype, MSN, Yahoo, or working on MS Word, Excel, and even OpenOffice. It doesn't matter. The software of this LED Globe typing assistant runs in the background of your windows operating system, allowing the glow light to respond to any inputs on your keyboard. Turn that boring desktop into something a little more exciting, with the LED Globe Light with Keyboard Response you can make your work desk time a little more joyful. It is in stock in our warehouse right now and we will ship it out tomorrow - guaranteed! The faster you type the brighter the LED gets. Does this product need batteries? No, it is powered by your computer USB. Can I use this at home? Yes, you can use it at your home or office desk.